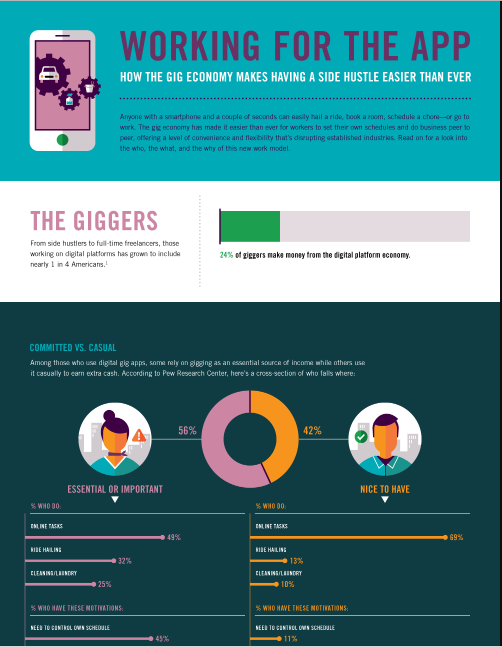 This infographic by Concordia University-Saint Paul looks at the who, what, and why the gig economy is happening. From side-hustlers to full-time entrepreneurs, those working on digital platforms have grown to include nearly 1 in 4 Americans, and 56% are relying on these platforms as an essential part of their income. Even white collar workers want in on the action, with 63% of executives with management skills saying they'd leave their full-time position if an opportunity for contract work arose. The gig economy has made freelancing mainstream, side-hustling easy to come by, and daily services available at your fingertips.